Peet's Coffee What Fills Your Cup? Giveaway: Win Free Coffee! Peet’s Coffee wants to know what fills your cup. 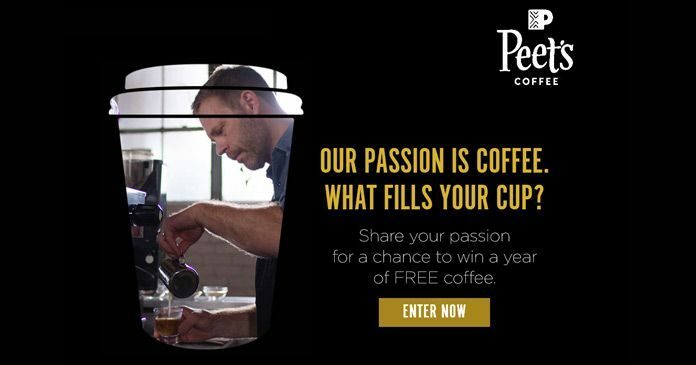 Share the passion in your life by uploading a photo at passion.peets.com and be automatically entered into the Giveaway for a chance to win a year of free coffee, awarded as a $1,000 Peet’s Gift Card. The Peet’s Coffee What Fills Your Cup? Giveaway is open to legal residents of the 50 United States and the District of Columbia (excluding Puerto Rico and all other U.S. territories and possessions and overseas military installations) who are 18 years of age. The Promotion begins September 27, 2017 at 12:00:01 AM PT and ends at 11:59:59 PM PT on November 20, 2017. Take an original photograph in which you share the passion in your life then, visit www.peets.com/passion to complete the Promotion registration form with your first/last name, email address, and upload your Photo to receive one entry. There is a limit of one entry per person per day, regardless of entry method used. Winners will be randomly selected in a drawing conducted on or about November 29, 2017. Potential winners will be contacted by the email address associated with their entry. Five winners will be randomly selected and each will receive “free coffee for a year”, awarded as a $1,000 Peet’s Gift Card. There are a total of five prizes available with a total approximate retail value of all of prizes of $5,000. For the names of winners send an addressed postage affixed envelope to:What Fills Your Cup Winners List, PO Box 26597 Scottsdale, AZ 85255. Requests must be received no later than December 31, 2017.